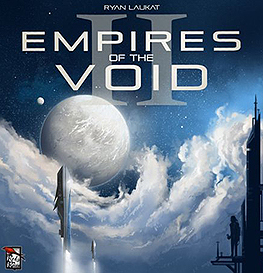 Empires of the Void II tells a story about eight fringe planets and the species that live on them, through unique event and action cards. You'll find ancient ruins, stop planetary wars, transport desperate leaders to distant locales, and rescue worlds from imminent invasion. Will you choose to conquer or befriend the aliens you encounter? Your alien allies will give you powerful abilities, and unique characters you can recruit. CONTAINS: 5 Worldship miniatures, game boar, rule book, 10 planet tiles, 40 allied units, 10 ally tokens, 12 explore tokens, 6 cargo tokens, 52 credit tokens, 10 fungus tokens, 30 starfarer tokens, 8 war bot tokens, 15 star sloop tokens, 60 building tokens, 51 goods tokens, 9 command track tokens, 2 path tokens, 6 Sarkeen Regency tokens, 1 parasite token, 1 doom token, 5 player boards, 14 dice, 75 plastic influence markers, 75 plastic control cubes, 4 event tokens, 1 command token, 1 action token, 45 event cards, 63 power cards, 30 empire cards, 3 player aid tokens, 1 score card, 5 colonisation cards, 1 first player card, 2 heecrix invader tokens, 2 anonian warrior tokens.